This is by no means the finish line, but it’s an important milestone, and if you are following along, make sure you take some time to give yourself a well-deserved pat on the back. 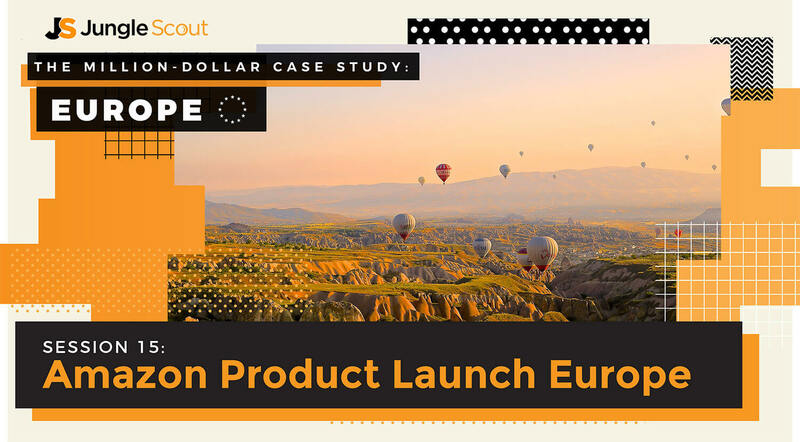 In this session, we are going to cover the latest in Amazon product launch strategies for my European launch, but this is still useful for any marketplace. We’re going to cover a range of different launch tactics, how they work, and the benefits and downfalls of each. By the end of this session, you will be armed with all of the knowledge you need to know to decide on your own path to launch. If you are following along and also launching in the UK then you will want to stick around until the end, as there is an exclusive free trial for Jump Send for all UK sellers. But there have been a few hiccups, namely, in getting a new Amazon Europe Seller Central account approved for this product. Sometimes, these things can happen, and they are frustrating. What’s the deal? Well, we’re not sure if it’s a bug or if Amazon is just super backlogged due to the time of year, but they are taking their sweet time in approving this account. We have provided all of the information we can and we’re trying our utmost to get Amazon seller support to help us out. It should get approved soon, but right now we have to ride it out. Well, it means I cannot generate an FNSKU yet, or create a shipping plan. So this means that I need to either hold out before shipping any inventory… or send it using the EAN (European version of a UPC barcode) and pay Amazon to stick the FNSKU over the top when it lands at their warehouse. What can you learn from this? Well most of all, don’t hang around to set up your Seller Central account. You can do this as early as when you are doing your product research. Let’s set some goals, first of all. Luckily there is only one main goal, of which a few different things will feed into making it happen. We want to get a good page rank. When you first launch your product, think of your product listing as a work in progress. It’s brand new, and it needs to gain momentum so that Amazon will rank it favorably in its rankings. The better your rank, the higher your product will appear for your targeted keywords, and the more conversions and sales you will get from organic search. These are the best types of sales because they don’t cost anything (compared to sales from PPC ad clicks). However, what does cost money is the upfront investment you will need to make to get your product ranking up there with the competition. What Goes Into Amazon Page Rank? Social proof is also really important, as this greatly helps to increase your conversion rate. And, the higher your conversion rate, the more sales you are getting, which means a great sales history. They’re all closely linked! What can we control to positively impact sales and conversions? There are also other things that you can do to increase sales, which involve doing some marketing outside of the Amazon platform. More on this coming up. As you can see, the level of effort, difficulty, and cost varies for each. That’s not to say you can’t do all of them if you wanted to. But the advice we gave in this session is to carefully decide which tactics are most suitable for you and your business and double down on those. 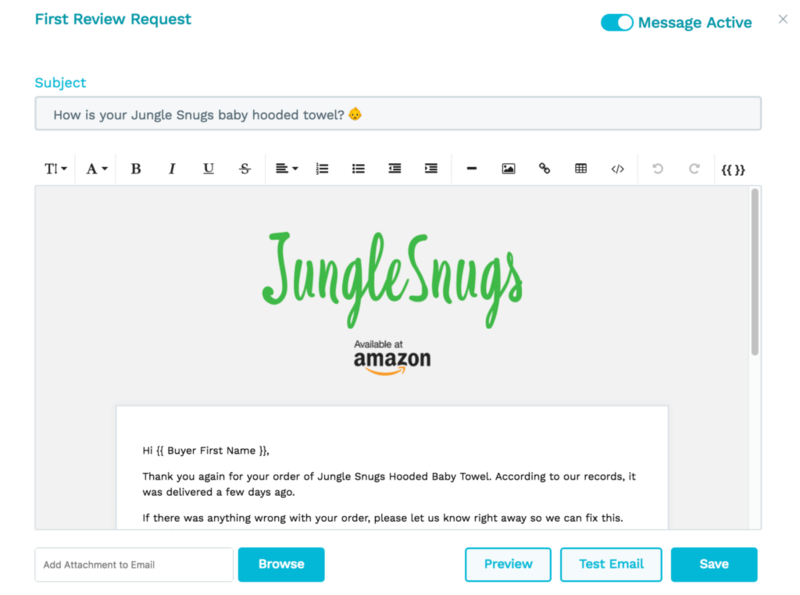 Spoiler alert: For the launch of Jungle Snugs, I will be utilizing Jump Send to run promotions and send automated emails, alongside some aggressive PPC campaigns. Overall, the barrier to entry and cost of this method are low, but you will need to invest by the way of selling your first units at a very deep discount. This should be seen as an upfront marketing investment for future success. The cost to using a deals site is also relatively low (compared to some other methods). Jump Send costs $29/ month and with this you can run promotions and set up automated emails to try and gather positive reviews. Disclaimer: Jump Send is a sister product of Jungle Scout. 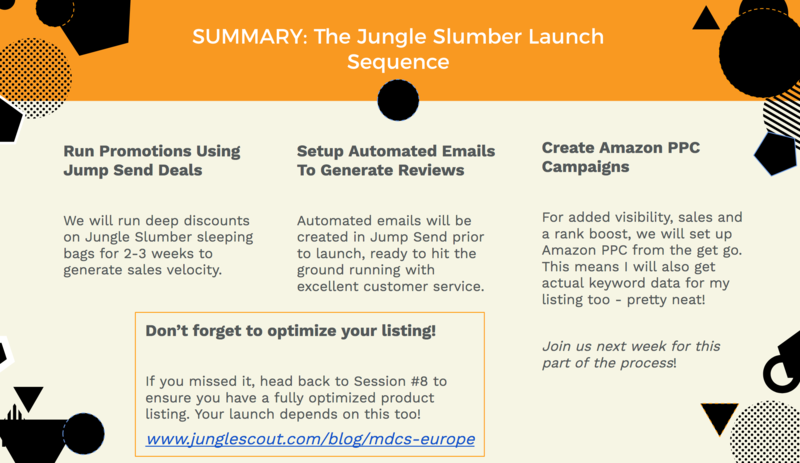 You can use other deals sites too, but for the purposes of this case study we are going to show how I am launching Jungle Slumber with Jump Send. ✔ The reports provide you with actual keyword data about what shoppers are searching for on Amazon, extremely useful! ✗ It’s a great method but usually not enough on it’s own, which is why I will be pairing this with promotions and automated emails. The cost of Amazon PPC varies vastly, it depends on your product, and the competition. You can expect to pay 10% – 40% for your most relevant keywords. When using this method to launch you will want to be more aggressive and bid higher. Again this is an upfront marketing investment for the future of your product. After launch, you can optimize your campaigns and tone that down, to ensure you are getting good return on investment. Again, this varies greatly. But it can quickly become an expensive mistake if you bid aggressively and do not receive any sales in return. Remember, advertising to people on Amazon is like advertising to people who are already looking for products. Though targeting is advanced on platforms like Google or Facebook, you may just end up getting clicks from people who aren’t really interested in purchasing your product. Greg mentions in this session that he tried this tactic with other case study products, and even with an experienced PPC professional working on the campaigns, it didn’t turn out to be a fruitful investment. It likely depends also on your product niche and other variants. Other than costs of an email marketing platform (such as Mailchimp) this method is practically free. Because it relies on an existing audience you already have, so all you need to do is market your new product to them, usually via email. If you decide to launch to an existing audience with promotions then obviously you also have the associated cost with that. For those sellers launching products in niches they are already invested in and have an audience, this is a no-brainer! This can be quite costly, because you need to build and host a website. Usually, you will generate a list of email addresses of people interested in your niche by running a promotion. Other ways to do this include running an influencer blog or affiliate marketing, both of which take a lot of time and dedication. It’s definitely going to cost you in time or money, or both! Here’s an overview of my own launch strategy for the sleeping bags! I am going with the most cost and time effective options, which is how all of the case study products have successfully been launched. Right now I am going to walk through the first two steps, and then step three, Amazon PPC will be covered in the following session. A previously mentioned, I will be using Jump Send, which has just relaunched with full support for the UK marketplace. Creating coupon codes and promotions is super easy using Jump Send. You have to first set up a promotion within Seller Central to generate your coupon codes, and then create a promotion within Jump Send and enter these coupons. The app will automatically pull in your products once you have synced your account, and the whole process only takes a few minutes. You can watch over Greg’s shoulder on how to do this in the replay, or in this handy tutorial video. How long should I run my promotion for? Go for a couple of weeks to begin with – you can monitor how many of your deals are being used up and make a judgment call from there. 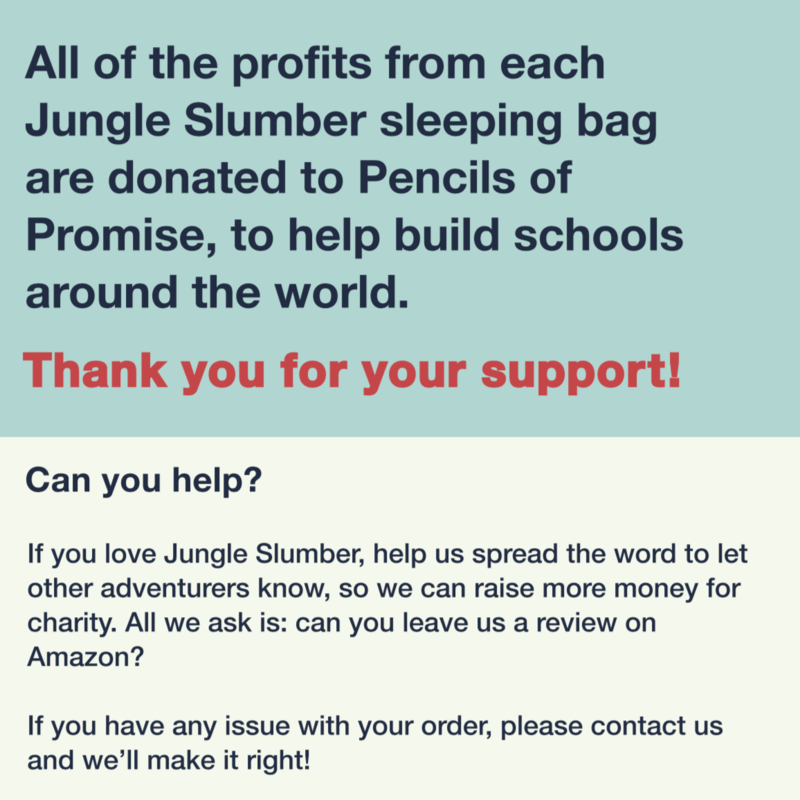 It will depend on how much inventory you ordered, but as I have 1500 units of the Jungle Slumber Sleeping bags (750 for each size), I will likely generate between 70-100 coupon codes for each size. Jump Send allows you to set it up so that you have to manually approve each coupon request if you want to do it this way, so you always have full control. If I find that my coupons get used up within the first week, that’s a good sign that my sales velocity and history is up. If the coupons move a little slower, then I might let this run for a little longer. Additionally, if you start to notice organic sales coming through at full price, this is when you know it is starting to work. How much discount should I offer? People on deals sites like Jump Send are after deep discounts. If you set up a promotion with a 10% discount, do not be surprised if it doesn’t fly. 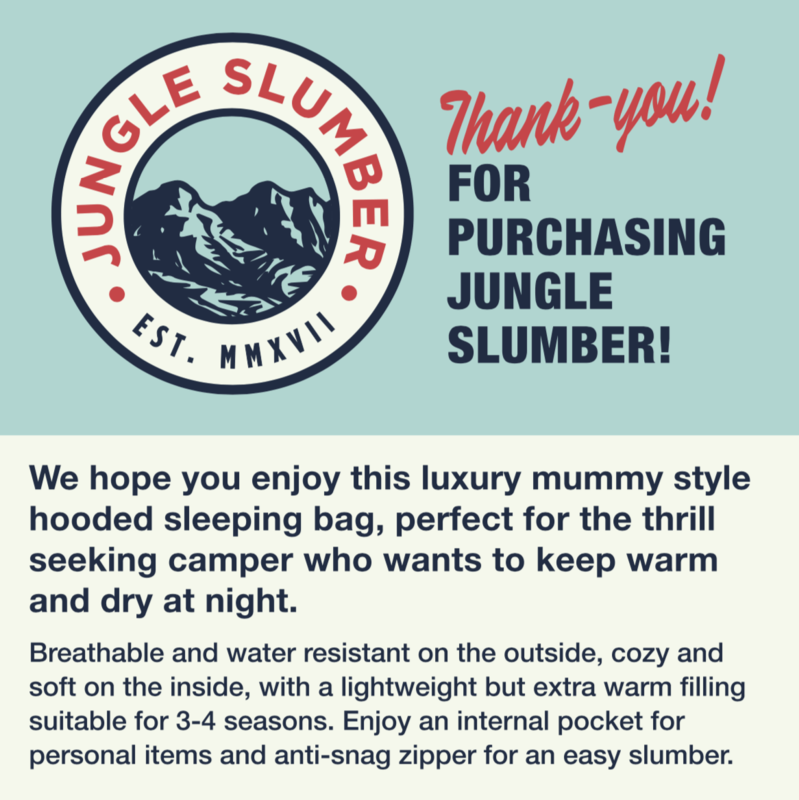 For Jungle Slumber I will start with around 70% and see how it goes, if the coupons move slowly then I may increase that some more. One of the benefits of Jump Send is that it is an all-in-one tool for both promos and emails. Sending emails to your customers is important because it provides an improved level of customer service, which is a very good way to ensure you maximize your potential of getting reviews. Plus, Jump Send also allows you to trigger an email if a customer initiates a refund, which can help you prevent negative reviews. 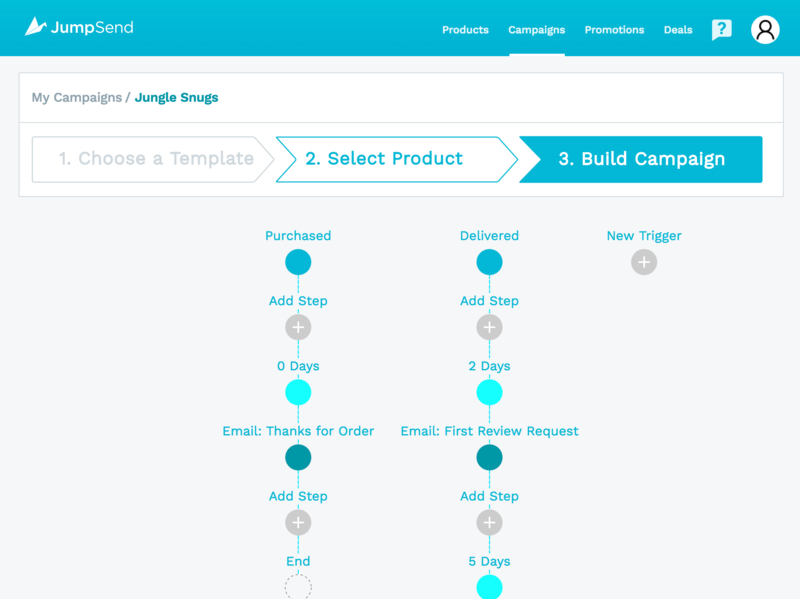 Again, Greg walked through the process for setting up email campaigns in the new and improved Jump Send dashboard, or you can watch this instructional guide here. You can easily set this up using existing templates within the platform, or create your own emails from scratch, and add your own logic such as how long to wait before sending the next email. When it comes to getting reviews, these emails can be powerful. Sellers see an increase in CTR (that’s clicking through to the Amazon listing) from 2.2% to 3.7% (a 59% increase). Get more information about the new features on Jump Send here. Here’s a few top tips to guide you and ensure that your emails are effective and that are within Amazon’s TOS. Provide excellent customer support – let the customer know that you are there. Many Amazon purchases are done without ever knowing there is a human being running a business behind the scenes. Make sure they know you are there, that you care and that you are contactable should they have any questions. Include links to websites – this is against Amazon’s TOS. They want to keep shoppers within the Amazon ecosystem. Plus it’s probably in your best interests to focus on sending them to Amazon to leave a review anyway. Include too many images – this risks being caught as spam. Just include one image in your email, and if you want to, a small logo at the top! If you are following along, now is the time to start planning and executing your very own product launch. You can use a combination of the strategies outlined in this session to suit you. Don’t forget you can grab the homework swipe sheet with all of the information comparing these launch tactics here. Finally, if you are launching in the UK yourself then you can now access an extended 90 day free trial for the launch of Jump Send UK. We won’t offer this exclusive deal again, so make sure you sign yourself up if you are launching in the UK (or already selling there)! ➡ Go to session 16! Let us know how you get on in the comments, or if you have launched before and have some experiences to share, we’d love to hear it! I heard there is an update of Amazon TOS that you can only send 1 follow up email now in 2018. Is it true? I’ve seen this one floating around the rumor mill – but as of now I still have seen no concrete evidence of this and many sellers are still sending their usual 3 email sequences to great success. We always stick to Amazon’s TOS and will inform our audience if we ever discover any confirmed changes on Amazon’s front. Couldn’t think of one but I heard that at least some other deal site providers in Europe forbid being on both sides. Keep on going, love what you’re doing! You can use Jump Send as a shopper if you wish to, to purchase other products that other sellers are offering at a discount. But you shouldn’t purchase your own product or leave reviews on your own product as this would be against terms of service. 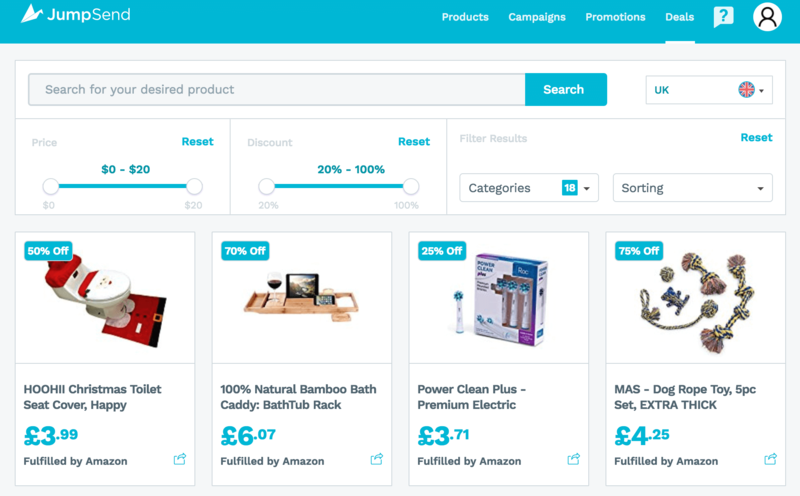 Definitely check out the shopper side of Jump Send if you are intrigued to see how it works on both sides – but if you want to run a promo on your products as a seller then make sure it’s all set up correctly and let the shoppers come to you. If you find you get no sales, consider if your discount is deep enough for your product. great Session, I accompany you throughout the Million Dollar Case Study both in America and Europe.well done for the explanations and success in your project. 1. In jump sand, can I enter a condition for sending emails for customers who review a 3 star, 4 star, etc .And can I send aמ automatic thank-you email after a customer has Written a review. 2. Regarding the velocity of sales: Does Amazon refer to the price of the product ? For example If a product costs $ 5 and has 10 sales a day, is it equivalent to a $ 50 product with one sale per day? 1. Unfortunately not – we can’t do this right now because of the way Amazon works. If this ever changes then we will definitely move to support this functionality.